If you’re a FOODIE then a cooking class might be just what you need. 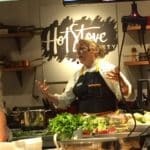 Seattle chef and restauranteur, Tom Douglas owns many, many well known restaurants in the Seattle area but many don’t realize he also has a cooking school Hot Stove Society. Tom and his staff believe that people want to cook and be connected to the food they eat, so check out his website and take in a cooking class during your visit to the The Emerald City.